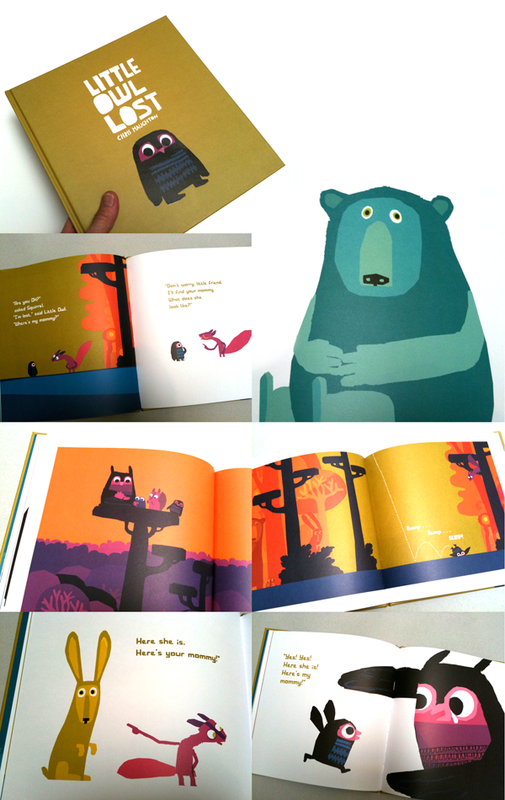 Graphic designers make a different kind of kid’s book. They see differently, draw differently, and give a lot of credit to their readers. A Long piece of String, by William Wondriska was originally created in 1963 and has been just republished. A wordless story that is simple, bold, and clearly timeless. Gorgeous and loose drawings printed in red and black ink on warm uncoated paper—all strung together to tell a graphic story of scale, form, nature and even the alphabet. The unwrapped cover is worth the price alone. Here’s to Chronicle Books for reissuing this rare jewel. 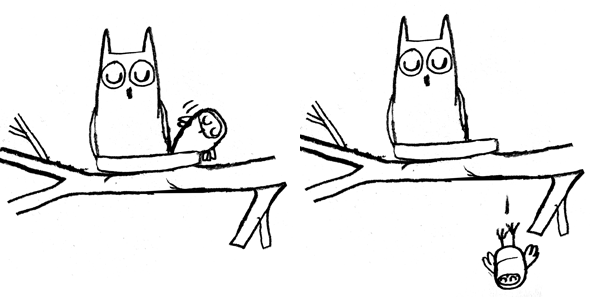 Little Owl Lost has nearly every redeemable quality of an exemplary book. Present is scale, surprise, hidden secrets, suspense, color, white space, story—and most of all—cute animals with big, expressive eyes. But what is most striking to me is the dramatically graphic style in which illustrator/author Chris Haughton has drawn this story—masterful capturing of forms with sparing essential detail. From what appears to resemble cut paper, each illustration carries the marks of both craftsmanship and happenstance, not unlike the work of Leo Lionni and Eric Carle. Chris actually creates these illustrations from graphite drawings that are scanned and secretly colored and composed in his computer. However sophisticated and digital his method, he has maintained a rawness that looks every bit ‘unplugged.’ Though rendered in completely flat colors, Chris achieves remarkable depth—particularly in his lushly forested landscapes—with the use of multiple subtle overlaying tints of vibrant and complimentary colors. What feels like a festive Mexican palette, he has strayed far from reality and created a fantasy world that’s both enticing and believable. The story lives up to the measure of the artwork. The little owl tries again and again to find his lost Mom and on the way meets up with a magenta squirrel, a turquoise bear, a yellow rabbit and a blue frog—all depicted with beaming eyes and long fingers that point him in the right direction. A beautiful book all around. CF How do you create your illustrations? CH The images are created in pencil first before scanned into photoshop. I change the colours and tweak the images there and move them around much like a collage so in that sense they work very like paper cuts. I ended up using the computer quite a lot with Little Owl Lost. It became almost entirely re-constructed digitally by the end of the process, but many of the outlines have kept the original rough pencil edges. CF What was your biggest challenge making Little Owl Lost? CH I think the hardest part of the process was fitting the story into the book format. I worked before as an animator and so the narrative part came quite easy but the fitting it into the 32 page format was very difficult and quite frustrating. It takes a lot of juggling and painful editing to make the pagination fit and have the pages land in the right spot for the ‘surprise’ gags and the keep the pacing right. CF Name a favorite kids book. CH Difficult one!! perhaps my favourite kids book author is Beatrice Alemagna. Un Lion A Paris is probably my favourite of her picture books. The way she tells her stories is always incredibly inventive visually. She uses a very wide range of mixed media but manages to make it sit together and work together. Her stories are simple but powerful and they can be read by all ages.